Alltop.com is a Web site that enables its users to browse news headlines and lead paragraphs of stories on topics (or from news sources) that interest them. So, for instance, you can go to the Alltop page on topics ranging from Accounting to Zoology, or on health topics such as Acne, Nutrition, Prostate Cancer or Women's Health. And there are aggregated pages for all the Web feeds from CNN, Fox News, MSNBC and the New York Times, as well as the Washington Post, CBS News, USA Today and the Wall Street Journal. 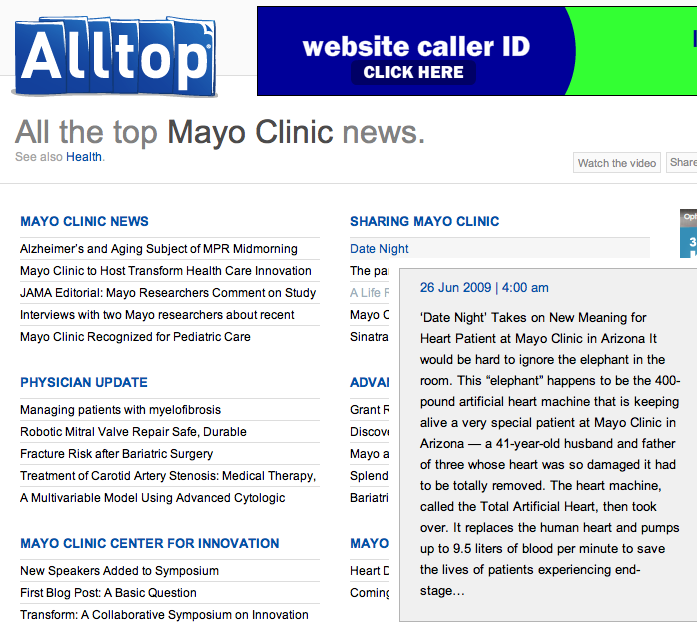 This week, Alltop created a page for all the top Mayo Clinic news, which incorporates news feeds from Sharing Mayo Clinic and various other Mayo blogs, including the News Blog, Advancing the Science, and several from MayoClinic.com, including for example its Pregnancy blog. Mayo Clinic is the first medical center to have its own page on Alltop. But the simplest way to see how it works is to try for yourself. You might want to bookmark or "favorite" this page as a convenient way to scan Mayo Clinic news in one easy place. It's also listed among the links in the right column of this blog.